NOURISH YOUR BODY: Get a powerful one-two punch of premium organic superfoods and plant-based protein with Organic Greens + Protein. Nothing artificial and non-GMO. CREAMY VANILLA PROTEIN SHAKE: Deliciously smooth, filling and easy to digest without any soy, dairy or added sugar, so you can feel good about how you fuel your body. RELY ON 44 ORGANIC SUPERFOODS: Give your body and mind what it needs! One scoop of Super Green Juice has 44 organic superfoods, probiotics and enzymes to feel your best. The dynamic duo of Super Green Juice and Organic Super Protein give you a one-two punch of premium, organic nutrition to nourish your body, fuel energy, strengthen immunity and power through your day! 44 organic superfoods in every tasty scoop! 18 g of delicious vanilla superfood protein! Juicing is a Superfood Reset for the Metabolism so you burn away fat, have more energy, and feel GREAT! Imagine getting the goodness of dozens of organic fruits, veggies and herbs at EXACTLY the right balance for health and vitality. Juicing, especially GREEN juicing comes with amazing health benefits to detox and alkalize the body, and provides essential vitamins, minerals, and antioxidants. 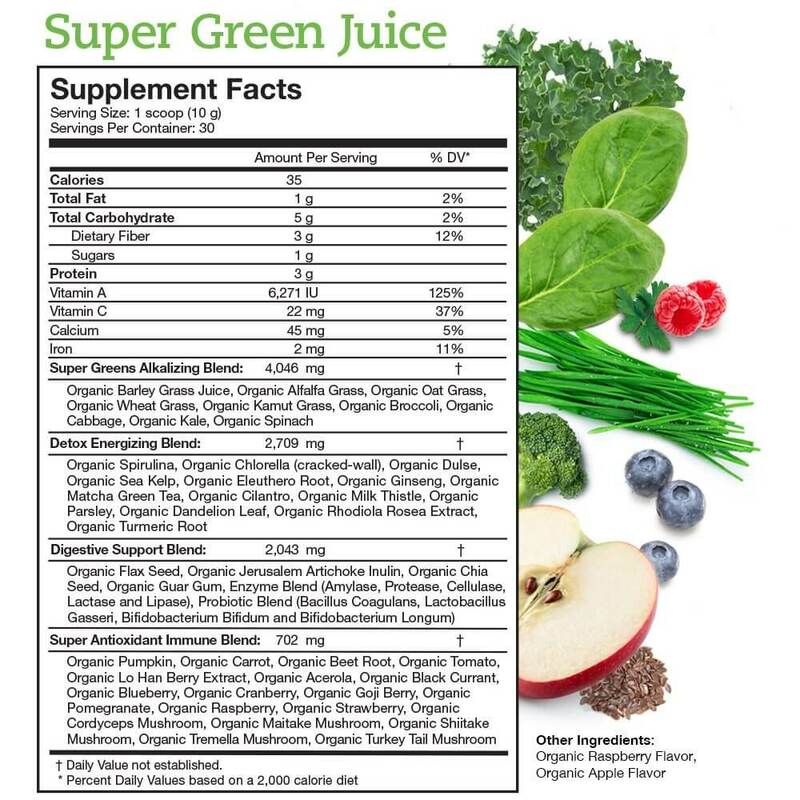 Super Green Juice has 44 certified organic superfoods to help cleanse your system, and unleash your natural energy! Nothing artificial, no added sugar, and it has a light refreshing taste! Super Green Juice makes your morning routine easy. Just mix a scoop, drink it and you’re on your way to high energy, improved focus and allover better health. Superfood Plant Proteins satisfy your appetite, support lean muscle mass, and fuel workouts and workdays. Want to feel full, satisfied and fueled up for whatever comes your way? Increase your intake of organic plant proteins to build, strengthen and recover. It takes a LOT of time to make a truly healthy protein-rich meal, but with Organic Super Protein you can have a perfectly balanced, certified organic, delicious shake in seconds. 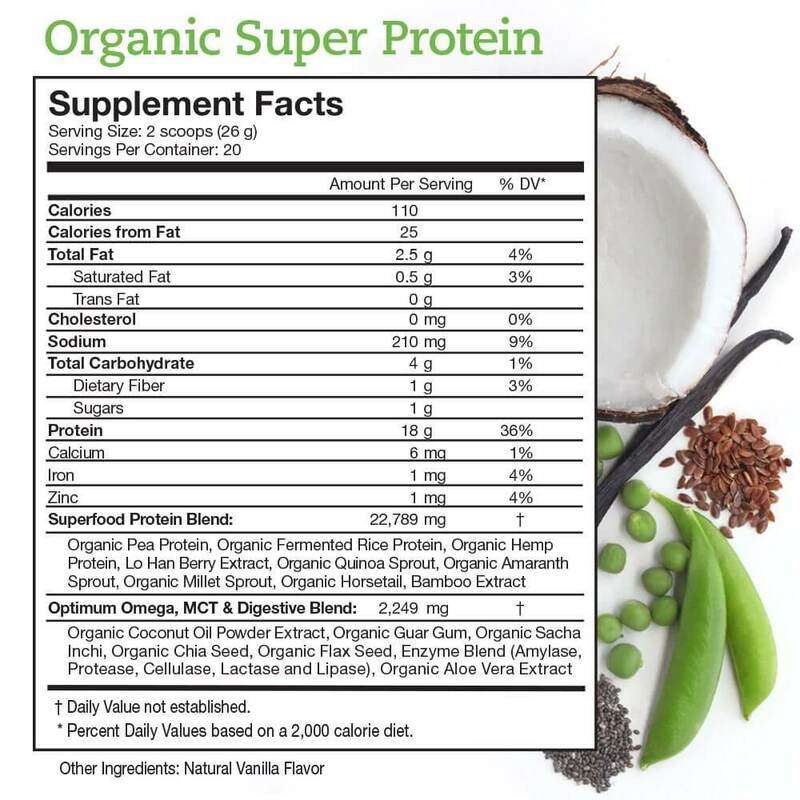 Organic Super Protein is certified organic, vegan, non-GMO, free of soy and dairy, has no added sugar and nothing artificial. It tastes amazing and is even gluten-free! Organic Super Protein gives you 18 g of fat burning protein, plus energizing MCTs, heart-healthy omegas and added digestive enzymes for a deliciously satisfying vanilla shake!